I am no longer living in Medellin. My wife developed a cancer in 2011 and we moved back to San Diego in February 2013. She died in May of that year and I just don’t have the heart to go back alone. I still love Medellin and all my friends and family there but I doubt if I will return any time soon. I am pleased to announce a new blog, English Practice in Medellin. It is dedicated to assisting Spanish speakers improve their use of English by providing a safe practice space. If you are interested in participating either as a native English speaker or as learner please visit us at English Practice in Medellin. The big flower and orchid show, Orquídeas, Pájaros y Flores, starts at the Botanical Gardens today and runs through 07 August. Check the earlier post on this subject for the times and ticket prices. If you are into plants, don’t miss this one. Here is a great link to the members of Colombia’s Olympic team. This site also has the schedules and other good information. 07/28/2012 Colombia’s first Silver Medal goes to Rigoberto Urán in the road racing competition. Congratulations Sr. Urán. * At today?s exchange rate of about 1800 pesos per dollar. This show is well worth the price and the effort to go. See ya there! OK, here is a link to the official guide. The 2012 Feria de las Flores Starts 03 August. It’s getting close to the time of year again when Medellin goes crazy for a month. This is a link to the preliminary schedule. I will post the final version when it is available. Lots of fun stuff to do including the big orchid/flower show at the Botanical Gardens. Here is some amateur video from last years show. Other popular events include the antique car parade (Desfile de Autos Clásicos), the horse parade (caballgata) and of course the sillateros. 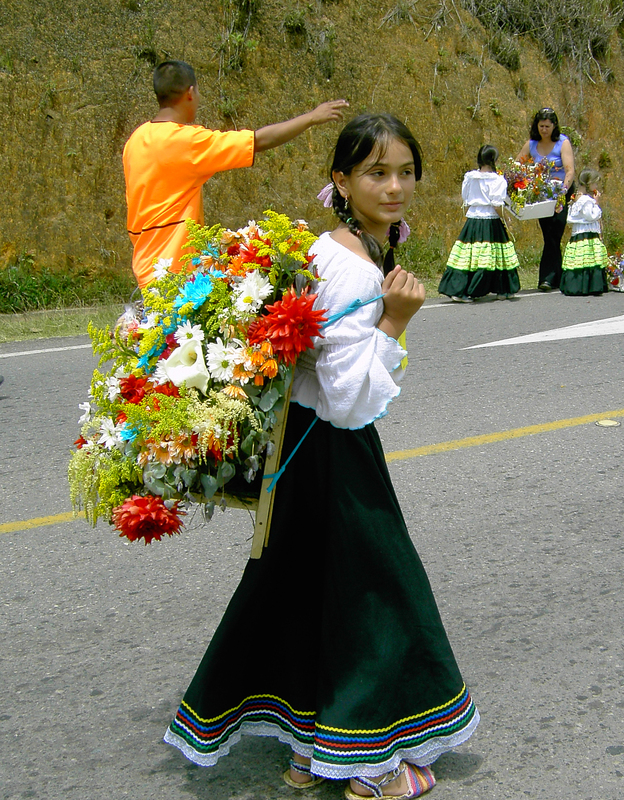 These are traditional floral displays that originated with transporting the flowers from Santa Elena where they are/were grown to the market places of Medellin. They are beautiful indeed. These are just a few of the events that will take place all over the city and for most of the month. Please check the preliminary schedule for a better idea of just how much happens during August. Here is link to the free programing at he the Teatro Lido during July 2012. If you are not familiar with this theater all performances are paid for by the City of Medellin. It is located on the southeast corner of the Parque Bolivar downtown. That’s that plaza in front of the Metropolitan Cathedral. If you are an US citizen and wish to take part in the upcoming Federal election here is a site that will help you do so. State and local elections are a little different but if it is to your advantage you can generally vote for those candidates and issues. Be sure to read the Myths and Facts About Voting From Abroad pages. The Expat blog is offering some new services relevant to those who live in or would like to live in Medellin. These are the Housing in Medellin and Jobs in Medellin pages. I have not had much of an opportunity to use them yet but I am hoping we support them because they could provide very useful services. If you have not seen the Expat Blog it is worth a visit.